John Coyne - Water bailiff John Coyne was born in Chester in 1856 to Irish parents: Patrick Coyne and Mary Morrissey. Patrick, a widower, had married Mary on the 14th September 1850 in the Roman Catholic Chapel, Queen Street, and he gives his address as Stevens Street. In 1851 they are living in Canal Side; and in 1861 Patrick and Mary now with four children, and Patrick’s widowed brother John Coyne and his daughters are living in the notorious Parry’s Entry at no. 17. Patrick and Mary had six children in all: their first child Thomas had died aged two in 1854; their last, Margaret was born in May 1864 and died the following August, less than a month before Patrick himself died. With four surviving children to support - Ellen, 10, John, 8, Mary, 6 and Catherine 4 - Mary married Michael Gannon the following year; and they went on to have a further four children. By 1881 she was widowed again, lodging at 12 Parry’s Entry with her daughter Catherine Coyne, her three surviving Gannon children, and Catherine Gannon her step-daughter, and working as a charwoman. It’s hardly surprising that by 1891, aged 62, and with her daughter Bridget Gannon, she is a pauper inmate of the Chester Union Workhouse, Hoole, and that is where she died on the 27th September 1893. Her death was registered by her son, John Coyne, and he describes her as the widow of Michael Gannon, Labourer of 27 Union Street, Chester. John Coyne was born on the 27th July 1856; with only his baptismal record from St Werburgh’s Catholic Church to go on, I don’t know the address, but it was probably not far from Parry’s Entry where the family is living in 1861. John had ambition: by 1871 he is an apprentice to a tobacco pipe-maker, still living in Parry’s Entry, but with his uncle and aunt, James and Mary McAndrew. When he married Bridget Kenney on the 20th May 1876 at St Werburgh’s Catholic Church he gives his occupation as tobacco pipe maker and his address as 5 Cross Gun Court, Foregate Street. By 1881 John and Bridget are living at 26 Love Street, supposedly the centre of Chester’s dwindling pipe-making trade, with two children: Thomas Patrick was born at the end of 1877, and a daughter Ann was born in July 1879. John has had a change of career as in 1878 he began working as a water-bailiff for the River Dee Conservancy Board in Chester in their attempts to prevent the illegal netting of salmon. In May 1884 John was sentenced to a month’s hard labour for assaulting his wife, but this didn’t prevent him from continuing as a water bailiff, for he appears in court in 1888 as a witness for the defence of the head bailiff who was the subject of a trumped-up charge from another disgruntled employee. Interestingly John Coyne does admit during questioning to having been summoned previously at Cerrig-y-druidion for perjury, though the case was not proceeded with. Notwithstanding, Mr McShea, the head water bailiff, was found not guilty to the general approval of all present. 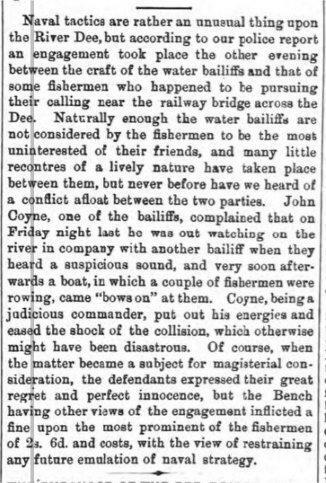 The report of the trial in the Cheshire Observer of the 18th February 1888, though not directly concerning John Coyne, is useful as it provides some information on the working conditions of the water bailiffs. There were five of them working under the head bailiff, Thomas McShea, “three of whom got 22s a week and clothes, and the others 13s and no clothes ... It was customary while the married bailiffs were away on duty for him [Mr McShea] each week to pay their wives a specified portion of their wages.” John Coyne refers to the “Parkgate affair”, when McShea had to report him and other bailiffs, including James Few, the husband of the prosecutrix, who had “got drunk and lost some nets which had been captured from a poacher”, suggesting that this grievance led to the accusation of indecent assault by the head bailiff on the wife of James Few. James Few himself was no longer employed as a water bailiff “having been discharged for quitting his work without leave. He admitted sending in a return purporting that he had been at work one day from five o’clock in the morning, while as a matter of fact he did not begin work till one o’clock in the afternoon”. The many exploits of water bailiffs versus poachers are gleefully related by the local papers, including this report on “naval tactics” from the Cheshire Observer of the 30 September 1882: Generally poachers and bailiffs all worked at night, so for the bailiffs there were problems of spotting those using nets and identifying them, added to this was the need to manage boats on the Dee in the dark. On a couple of occasions John Coyne is reported to have struck a “fire-staff” to light up the crime scene, but as this only provided a limited light it was possible for the defence, once before the magistrates, to try to make it appear that the bailiffs have conflicting evidence on what they saw. One particular case illustrates some of the problems: Five fishermen [...] were charged with illegally fishing, opposite Messrs. Muspratt’s works at Flint at half past one o’clock on the morning of the 20th inst. Water-bailiffs Coyne and Graham were watching the men fishing from the opposite side of the river, but were unable to get to them. [One of the defendants], however, made a draught on their side of the river, and his boat and net were seized. The bailiffs asked him to row them to the other defendants, which he consented to do. On nearing his companions, however, he informed them of the presence of the officers. The latter, however, quickly landed, and caught the fishermen in the act of taking a draught. Coyne asked for their names, but they declined to give them. [...] The poachers then made off with water-bailiff Coyne’s boots, which he had left in the boat. The bailiffs were left on a bank surrounded with water. They had to wade in their clothes across the channel, and Coyne had to walk four miles barefooted. Cheshire Observer 27 June 1885 In this case the men were identified, charged and fined; John Coyne and his companion were left soaked through, and in John’s case, with very sore feet. I do hope he got his boots back. By 1891, deserted by Bridget, and with his children with their maternal grandmother, John is a railway porter lodging at 9 Earls Villa, Foregate Street, Chester with James and Mary Ann Gallagher. He’s at the same address in 1901, but now Mary Ann Gallagher is widowed. In 1911, a licensed porter, he is a patient in the Chester General Infirmary. In all these censuses he describes himself as married. He died from TB on the 13th August 1913 and was buried three days later in Overleigh cemetery. His son-in-law John Charles Hopkins, who’d married his daughter Ann on 7th August 1899 in Birkenhead, registered his death, coming from his home in Aigburth, Liverpool to do so.